Leupold & Stevens introduced a new spotting scope into its lineup, announcing the SX-5 Santiam HD 27-55x80mm Spotting Scope. The SX-5 Santiam is available in a straight and angled model and is created for “diehard hunters and shooters.” The spotting scope features a durable yet lightweight armor paired with DiamondCoat2 and Guard-Ion scratch-resistant and water-shedding lens coating. Boasting a Porro prism construction, the SX-5 Santiam HD spotter offers an ultra-fine center focus wheel, adjustable eyecup and indexed rotational tripod ring. The spotting scope comes equipped with the Twilight Max HD light management system. The system delivers better light transmission as well as glare management in low-light shooting situations. Both the straight and angled models will come in the shooter’s choice of a Shadow Gray finish and will be backed by Leupold’s Full Lifetime Guarantee. 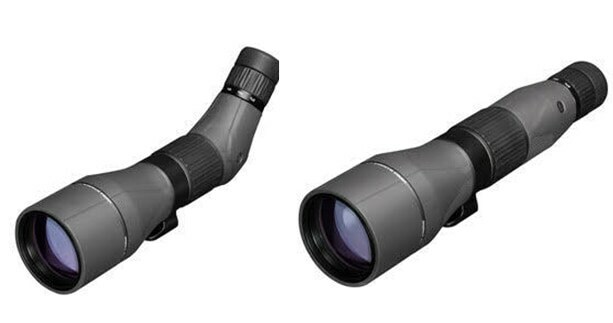 The SX-5 Santiam HD 27-55x80mm Spotting Scopes are set to enter the marketplace with a MSRP of $2,339.